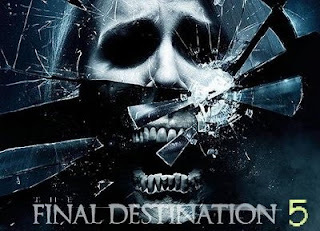 So it ultimately turned out that the fourth film in the popular American horror series, The Final Destination, was not the final destination as they've lovingly churned out number five for us. This time, new leading man Nicholas D'Agosto predicts and saves his work-group from their deaths in a bridge collapse. However as Tony Todd frequently appears to remind us 'one by one death will take them all'. I'm a casual fan of the series and was glad when it got a re-invigorating boost from the third and fourth films - both feeling grander in scale and providing lots more gory unrealistic fun, whilst also maintaining the high level of suspense. Although I did have some problems with FD5, they generally handled the suspense well in a couple of the knowingly upcoming death-scenes, from an encounter at a gymnastics training centre to a particularly tense ordeal in a laser-eye surgery clinic. In a film like this, these death scenes are incredibly important but those not mentioned above simply feel a bit lackluster and predictable, not resulting in scares or jumps and missing a lot of the creative spark of the earlier films. Don't get me wrong the gymnastics & laser eye surgery deaths were entertaining and creative but when we get the setting of the steal-works, any horror viewer with half a brain knows what's coming. It's this missing spark that really causes the film to suffer and ultimately fade out without a bang in a shockingly dull climax in a restaurant. However, the ending does slightly redeem itself with a clever tie into the first film. The acting is generally fine with the typical performances you'd expect from a film like this. Most of the cast are rather bland but there are some fun moments with David Koechner & PJ Byrne. There's also the return of Tony Todd's incredibly sinister yet camp morgue attendant, aptly named Bludworth. "Muhaha, you can't run from this predictable story." 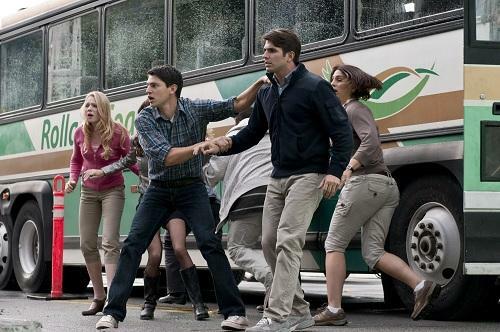 In my opinion, Final Destination 5 would have been better suited as a direct to DVD release. It brings nothing fresh to the series, simply goes over the exact same territory as all the previous entries, from; the accident, the slow realization your being hunted down, contemplating murdering someone else/saving yourself to death eventually catching them up; and to be perfectly honest it's getting a bit dull. People criticise other horror franchises like Saw but even by it's seventh entry it still felt fresh, well-written and edgy.